Are you searching for something different but so cool and helpful? Do you want heartbeat sound in your hands? If so, download our heartbeat sounds app. We are all familiar with the sound of a heartbeat, but have you ever wondered how would it sound on your phone? Wonder no more, we have different heart sounds, meaning heart sounds audio that you will not resist. 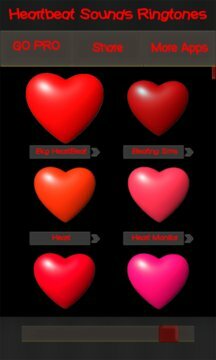 In our app you will find collection of different sounds of heart beat, heartbeat sounds that will relax your heart rate. There is no natural sound like a heartbeat sound and while you are listening sounds of heart beat you can feel how your body is getting relaxed and how you start clearing up your thoughts. We created heartbeat ringtones with an idea of providing the deepest relief you have never felt before. It’s no wonder why these sounds bring so many calming moments because they are designed to serve this particular purpose.Try calming people from your environment using the sound of a heart beat, your friends and family will be grateful to you for downloading heart sounds and having them on your Windows phone. Whenever your heartbeat starts racing for any reason all you need to do is close your eyes, take the phone out of your pocket and play our heartbeat ringtone. At the same time you can set our sound of heart beating as ringtone. When you don’t have right words to tell your significant other your feelings heart sounds audio are proven to be quite useful.This way you can show he/ she that your heart beats only for him/her.We can’t think of anybody who could say no to our app. Join us in this interesting journey and let your steps follow the rhythm of a heartbeat.Wait no more, our windows app and HeartBeat Sounds are waiting just for you! This app works for babies too, since the sound of a heart beat can calm the baby. Because of that, you will find heartbeat sound for baby. You can soothe your baby with the relaxing sound of heart beating. Also, heart beating sound has soothing effect on adults, by calming you and helping you sleep better. 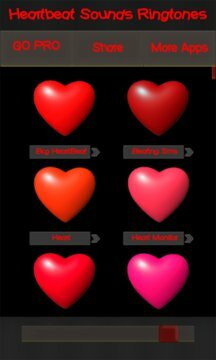 Plus, set sound of a heart beat as heartbeat ringtone, and enrich your ringtone collection with cool heartbeat ringtones.